This was recently posted on Facebook by the wife of a local vet. I will say no more for no more words from me are required. So true and so moving, Paul. We always stayed with our girls to the end. Doing a job of taking care of animals, and then having to go through that experience? My heart goes out to the vets. I can only shake my head at the animal owners for being so thoughtless; so self-centred, and so uncaring. So, so true. We haven’t had to cross that bridge yet, and I know it’s going to ruin me, but there is no way I would leave any of them. Last year, at the vet, I passed man leaving, weeping, emotionally destroyed. I *knew* what had obviously just happened… But then I saw that his dog was in the room alone, with the vet and the nurses, in the process. My heart broke for that poor thing. Clearly it was hard on him, he couldn’t handle it, but PLEASE, that’s your dog in there and he’d left it alone for that final moment. Heart wrenching. Thank you for sharing Paul. I hope it gives more people understanding and courage. Heartbreaking all the way ‘round. I am old enough to have experienced the ending for all but one of my beautiful dogs, each having taught me immeasurabe lessons in this letting go. My heart is with the vet who wrote the request. I can’t imagine what a month, a week, even a day, of their helpful/caring/compassionate lives must be like. That said, I do want to mention that twice now, I have availed us of that compassionate service, by inviting our vet and helper here to our home for this final ‘so long’ (never ‘goodbye’ as my grandfather would always tell me..bless him…) and now, we would have this finality handled no other way. Blessings to you all…. Woke up some 45 minutes ago and have now read all your deeply moving comments. “Thank you” seems inadequate but that’s my head getting in the way! My heart reaches out to each of you, and I know Jeannie’s heart will echo mine, for each one of you is a living example of the love and goodness that this world so desperately needs. I cried even as I read this. Our pets are our companions, a very part of us and they need the assurance we will ALWAYS be there for them as they have been there for us. Baby Ruth was my best friend when my children were small and putting her down was the worst companion put down I have ever had – none were easy but her was the hardest. She was 14 and riddled with cancer. 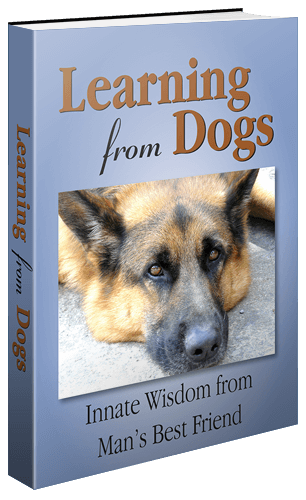 I have written a book honoring all the loved dogs through my life as they are now in heaven waiting on me, because ALL dogs go to heaven. I believe that God knows how much they mean to us and that he wants us happy in heaven therefore our companions will meet us there. Excellent words… And I held each of my beloved pets in my arms as they took their transition.. And even now after all these years.. Tears well up at the thought. That is heartbreaking and I promise, when our dog has to go and if it is this way; we WILL stay with him. My husband had to go through this when our other dog ended up dying after being hit by a car while he was walking her across the street (absolutely devastating!). He was there and stayed with her. I couldn’t be there because it happened so fast and without me knowing, but he was and that makes me feel so much better knowing she was not alone! We try and avoid death at so many costs, but it is part of life and an important thing to go through and gives perspective to life in way nothing else truly can. I can’t understand why owners walk out. Would they do that to their human loved ones? My experience (4 dogs and 3 cats) is that it’s quite a peaceful process. Twice I had the vet come and DO IT AT HOME and it was well worth the extra dollars, as many pets hate veterinary premises. I shall shortly be turning out the bedside light on this Friday evening, the last day of August in 2018. As I drift off to sleep in a few minutes time I shall carry all your beautiful words and loving thoughts with me, no doubt to treasure in my subconscious throughout the night. The leaving at the end seems incomprehensible but much like warning people to not leave their dog in the car on a warm day, I guess we need to educate them with this simple instruction. It makes me often wonder how it is humans are at the top of the food chain. Given that many people “dump” their aging parent(s) in a home, and the care staff see them through to their ultimate departure … I see little hope for many dogs to be much different. Much like dog abuse, in that some parents treat their children terribly … so why would we expect their dogs to be treated any better. Why are we humans at the top of the food chain? Possibly because so many of us are living a totally self-centred life, in that we dispose of anything that is inconvenient to us. Couple that with narcissism and greed, and we have a merciless recipe which could well eliminate us one day. I remember reading how much the business of arms and other military supplies depends on a war occasionally in order to stay commercially healthy! Scary!